If you haven't seen the Bourne Ultimatum, I have a great opportunity for you. In order to show appreciation to our customers, our potential customers, potential new Improvingites, and our employees, we're buying out a theater at the Studio Movie Grill in Addison next Thursday, September 6th. Networking and fun begins at 6:30pm, with two of our directors, Curtis and Barry, hosting the “Money Bag” game. The movie will begin at 7:00pm. 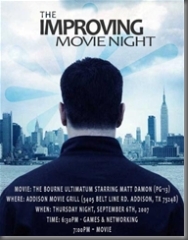 Improving will cover the cost of the movie tickets, popcorn, and sodas. If you and/or your guests would like to do the dinner/drinks thing at the Movie Grill, the full menu will be available for you to purchase from as well. We have seating for 250, and we're family friendly (the movie *is* PG-13, so fair warning). If you'd like to join us, drop a comment and leave your email. I'll get back to you. This is a great chance for you to get to know us here at Improving, so we hope you'll join us. Now the rub for me is that I am hosting the C# SIG that evening. Tim Rayburn will be going over C# 3.0, so both events should be great. I hope that you'll be able to make one or the other! Improving is hiring, and we're looking for some talented mentors. You are an expert at object technology. You know how to tame a complex domain with objects. You groove on creating adaptive object models – where appropriate. You understand how to get things done, iteratively and incrementally. You are comfortable guiding individuals and teams, and you can speak to a business person without confusing the hell out of them. You have developed/led software development using [one or more of] XP, Scrum, FDD, RUP, Fusion, MSF. You love simplicity. You respect the bottom line. You understand that risk isn't just something to avoid. Sometimes, it is something you take. Shipping software is a must. Theory is great, but Ivory Tower Folks need not apply. You would really catch our eye if you have production experience with Sharepoint, Biztalk, ESBs, Web Services, REST, BPM. If you've hand cranked your share of WSDLs and Schemas, that's cool too. It wouldn't apply so much in the current opportunities, but it would be great long term. We're looking for w-2 or contract-to-hire , but would consider 1099 contractors we know we can trust. We have competitive salaries, profit sharing, friendly people, and laptops that most people envy. We are particularly interested in people who live in the Dallas and San Diego areas or are willing to travel there. Travel happy people get paid more. Let us know your threshold for pain.